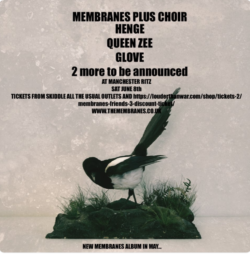 After the success of Macclesfield Festival over the last two years they are back for a third festival after the last two had attendances of almost 10,000. with an even better line up including some Louder Than War featured acts. Wayne Carey gives us the line up. 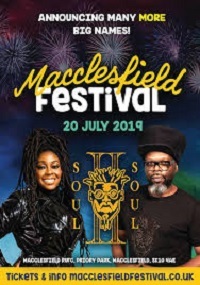 This year sees funk soul legends Jazzie B and Karen Wheeler hitting the stage as Soul 2 Soul, they are joined by another Manc diva Heather Small with THAT voice recognised by millions. There’s a whole funk garage soul theme going on this year as bands like De-Tronic and Warrington homeboys Winachi Tribe bring their own style to the forefront. I don’t even have to mention (but I will) Louder Than War tipped The Pagans S.O.H. Also the Manchester mammoth collective The Moods will be bringing their bus load to the joint! There’s a party going down in Macclesfield!! And the kids are invited. There will be a full family stage line up and CBeebies characters (I got me picture took with a Clanger at Bluedot once!) There will be two dance tents and an after party line up revealed shortly. The indie / alternative element will be represented by local bands and audition winners. Joel Gardner, Ashley Sherlock Band and The Claremonts were selected. Also local bands Shader, Ruff Twist and Queen Cult were selected to give Macclesfield based bands a platform to air their talents.